Ok so I have to admit that as much as I love Everlane, I'm not in love with their new and much heralded denim collection. First of all, I have way too many skinny jeans and I think in general I'm kind of over the skinny thing so I stayed away from that silhouette. Currently I'm loving styles with looser or straight legs and that's why I love my Frame straight leg jeans and my Mott & Bow slim boyfriend jeans so much. 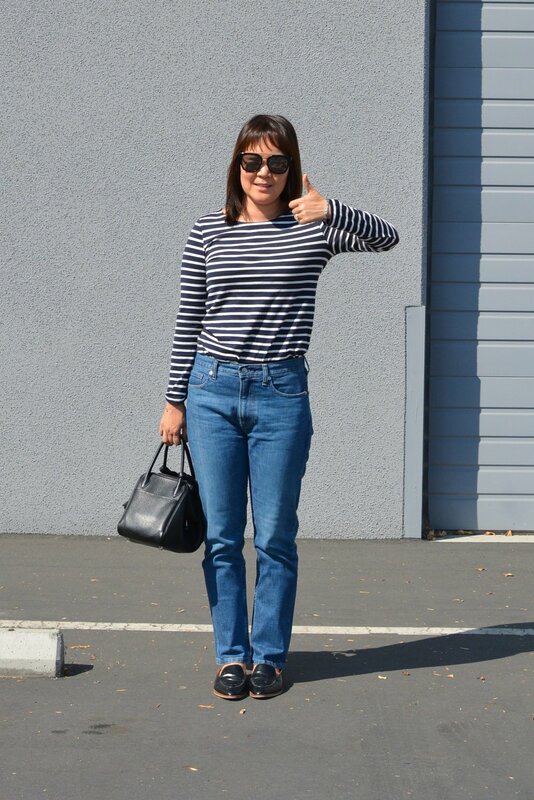 And I was hoping I would love Everlane's Modern Boyfriend jeans the same way, but to be honest I don't. For some reason the proportions don't seem right to me. It could be my short legs, in which case I could just hem it and that might fix my dissatisfaction. But my real qualm with these jeans is the crotch area. For some reason it balloons out a bit and at the same time there's a V-fold right at the crotch. And I'm pretty sure it's not a size issue since the jeans fit perfectly at the waist. I also noticed the ballooning effect on Andrea and Jamie, which makes me think it's the jeans and not me. I think it might be the 10" high-rise waist. Lol the thumbs up was me asking my husband if he liked the jeans. As for sizing, I went a size down for these Modern Boyfriends on the advice of other reviews. I'm usually a size 28 or a 6-ish on the bottom, and I ordered these in a size 27. Like I said the waist fits just right so I'm pretty sure I got the right size. Since these jeans are made from 98% cotton and 2% elastane, there's minimal stretch going on. So while these jeans fit well when standing, it does feel a tad constricting at my natural waist when I sit down, but I'm sure it'll stretch out a bit with wear. I'll try hemming these and we'll see if I like them better. But at the moment I find myself reaching for my Mott & Bow jeans more. Since the denim on both felt very similar I checked the specs and it looks like both brands use a 98% cotton and 2% elastane mix. In general I like the mid-rise of the Mott & Bow jeans (reviewed here) and the slightly slimmer legs. But we'll see, I'll update this review once I hem these Everlane jeans. Did you guys buy the new Everlane denim and what do you think?